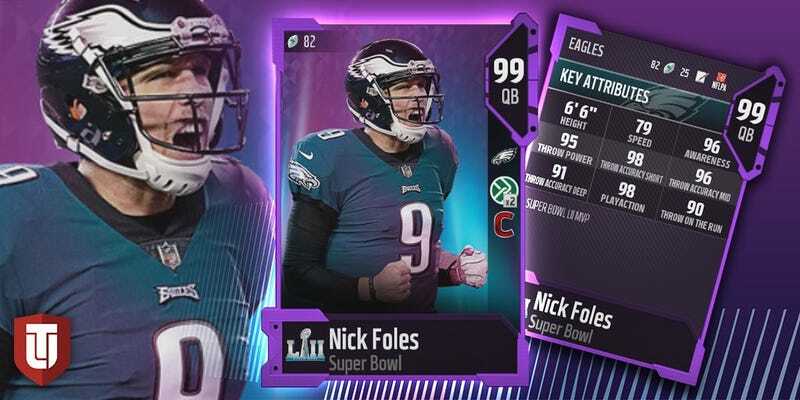 Philadelphia Eagles backup quarterback Nick Foles is now the highest-rated player in Madden 18's Ultimate Team mode, beating the likes of Tom Brady, Aaron Rodgers, and Drew Brees to get the game’s first 99 rating. That’s the highest rating possible in EA’s annual football franchise, which means that he’s currently the best player in Madden Ultimate Team. As expected. Foles, who replaced Eagles starter Carson Wentz after he tore his ACL in a week 14 game against the Los Angeles Rams, threw for five touchdowns and two interceptions in the last three games of the regular season with a middling quarterback rating of 79.5. He then exploded during the playoffs, throwing 971 yards in three games as he led the underdog Eagles to a miraculous Super Bowl win, where he caught a pass (?!?!!) and won MVP. Foles remains on contract with the Eagles, and unless he is traded, his new 99 Madden 18 rating will be on the bench this September. Note: this post has been updated to reflect that the rating is in Madden’s Ultimate Team mode.